The readings are about the stubborn refusal of the wicked to follow God. This obstinate rejection means being eternally cut of God. I don’t understand why someone would risk this, but they do. This describes self-justification which is an egocentric way of thinking a person manufactures to justify their bad behaviour. It is a set of false beliefs designed to help people keep doing what they know, deep down, is wrong. It is a sign of opposition to God, self-deception, and of the sin of pride. By self-justify our behaviour and holding onto our false beliefs, we place our self beyond the reproach of everyone (and God) and become a law unto our self. Such prideful persons refuse instruction, criticism, or correction; refusing to obey legitimate authority. This describes the ‘generation’ before Jesus who refused to accept his authority from God. The question becomes does our generation reject instruction, criticism, or correction? It only profits us if we answer this question individually. Before you answer, know that pride involves deceit. Know that you will dupe yourself if you are not prepared to face the truth. We read in Scripture, “pride so flatters a person that they fail to detect their sin” (Psalm 36:2). The deceit of pride is 1st our own. If you answered “yes, this describes me, I sometimes find taking instruction from a legitimate authority difficult, I can rebel against correction and criticism” you correctly recognise this tendency to sometimes being unteachable. If any of us answered no, we are arrogant and on the road of self-deceit. Through pride Adam and Eve were duped into thinking that they knew better than God. This lack of fidelity to (God’s) teaching is what caused the fall of humanity, and still causes us to sin. For example, the Church teaches that if we deliberately fail to go to Mass every Sunday, we commit a grave sin. If Catholics take issue with this teaching, it is proof they think they know better. Their thinking is constructed to justify to themselves the lifestyle they have chosen, and to mitigate their infidelity. Needing to be right they dupe themselves to cope with the dissonance (disparity) between their lifestyle and the choices they know are right. For the humble of heart, there are two ways in which Jesus teaches you. One way is illuminative and consoling, the other involves the purging of sin through the experience of interior desolation. Both lead to a deeper conversion and union with God. When the Son of Man came eating and drinking Jesus drew through his grace, mercy, peace, love, etc. which was attractive and consoling. So it is with us – God’s grace draws us out of ourselves. It is ecstatic and consoling, and we are willingly taught – directly, or through Christ’s representatives. On the other hand, desolation is introspective. Our attention is drawn to our sinful and wounded human nature. John the Baptist came to prepare Israel for the advent of Christ through repentance of sin. We heard this last Sunday. 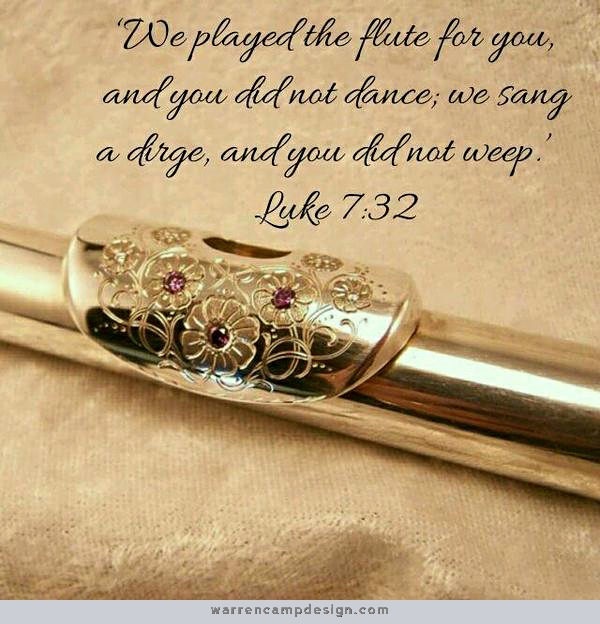 Today Jesus describes this as John ‘playing a dirge.’ A dirge is preaching that leads to introspection, the identification of sin, contrition, and a firm purpose of amendment. A dirge is meant to instil the fear of the Lord in people whose hearts are far from God. This is critical. Where there is no fear of God, sin speaks to the wicked in the depths of their heart (Psalm 36:1). So, another question arises: Among this group is the fear of God and the awareness of sin, present? And in general, what description could Jesus find for this community? This year there has been strife, jealousy, anger, fighting, dissension, factions, envy, and even hatred (Galatians 5: 19-20). These are the rotten fruits of a life without God. For a few, the behaviour this year has been like that of children shouting at each other in the market place, obstinately refusing our Lord who speaks to our hearts, calling us to repentance. Some unteachable individuals have claimed themselves as arbiters of right and wrong. Naturally, they place themselves on the side of right. To get what they have wanted they have manipulated people by manipulating the truth. Therefore, I want to briefly talk about pride and lying that moved this community from being a community of faith – to allowing satan to sift it (c.f. Luke 22:31,32). It is edifying for you to be aware of the subtlety through which this spiritual struggle occurs. According to St. Bernard of Clairvaux there are escalating steps of pride. Satan agitates our hearts tempting us to: exalt ourselves which is associated with boasting about our achievements to win the praise of others; exempt ourselves by treating ourself differently than we do others – no rules apply to us when we are so conceited; presuming our salvation; self-justification, thinking that what ‘I’ do is always justifiable; refuse to be under authority; to reject all restraints; and finally, to enslave ourselves to sin. Pride is insidious as we fail to recognise it because we lie to ourselves. With pride the lying begins through wilful blindness, then it progresses to a wilful choice to lie, as our hearts darken. It’s because pride involves lying 1st to oneself that it progresses to lying to others. Lying is contrary to the 8th commandment and consists in speaking a falsehood with the intention of deceiving (Catechism, 2482). The Lord denounces lying as the work of the devil (Catechism, 2482). I just want to mention one form of lying, calumny which Jesus list in the beatitudes, “blessed are you when people speak all kinds of calumny against you on my account, your reward will be great in heaven.” (Matthew 5:11-12). Those guilty of calumny are cursed, not blessed. Calumny consist of remarks made that are contrary to the truth and those remarks harm the reputation of others, giving occasion for false judgments concerning them. Calumny is therefore, malicious. This happens amongst you. I want this to stop. It has brought a curse upon this group. You cannot lie to paint a good picture of yourself and a bad one of another. This is a sin. On the other hand, the benefit of telling the truth is that you don’t have to remember what you have said, and to whom. At the end of our life we will all be judged. This morning’s dirge is not directed at all, but is salutary to all, myself included. We are all sinners. Let us repent of sin, humble ourselves before God and live according to the Spirit of the Truth (John 14:17). Jesus himself proclaimed, “For this purpose I was born and for this purpose I have come into the world—to bear witness to the truth. Everyone who is of the truth listens to my voice” (John 18:37). If you are not in a state of grace, please abstain from receiving communion. Advent is a time of preparation. I will be available after Mass for reconciliation, so everyone can prepare themselves for Christmas by a good confession.